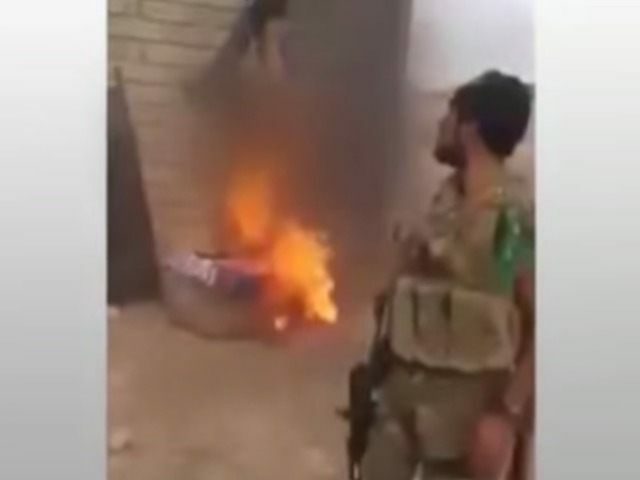 Iranian-backed militias consisting of Shia Muslims have released a video showing an alleged Islamic State (ISIS/ISIL) member alive being burnt alive in Iraq, reminiscent of a similar video in which ISIS jihadists burnt alive a Jordanian pilot. The terrorist group members identify as Sunni Muslims, who consider Shia Muslims heretics. The video is almost identical to the one released by ISIS showing Jordanian pilot Mu’ath al-Kaseasbeh burnt alive. However, this video ends before the viewer learns of the man’s fate. Flames engulf the man while he screams. A member of the Shia People’s Mobilization Unit, which is made up of a coalition of at least 40 militia groups, reportedly filmed the horrific incident with his phone. The group, with the help of Iran, formed in June 2014 in response to repeated failures on the part of the Iraqi government in curbing the Islamic State threat. These militias helped Iraqi forces retake the Sunni city of Tikrit, the hometown of ex-dictator Saddam Hussein. Grand Ayatollah Ali al-Sistani, Iraq’s top Shia cleric, issued a religious jihad fatwa on June 13, 2014, to push Iraqis “to defend their country and their people and their holy places.” He ordered the fatwa after ISIS captured Mosul, Iraq’s second-largest city. The popular mobilization forces have been following military tactics similar to those that IS has also been capitalizing on. This has been a major game-changer. However, there was another factor that changed the equation. Psychological warfare, which IS was employing during the first days of its invasion of Mosul, is known to everyone. The organization capitalized on rumors and the media, presenting itself as an invincible force that would not hesitate to commit the most heinous of crimes. This has deeply affected the Iraqi army’s morale. The popular mobilization forces have also tried to capitalize on this element, even if symbolically. They have done so by intensifying media campaigns, parading their victories and by shunning public criticism of the group’s members. The video emerges after a 14-year-old boy told the BBC that ISIS filmed militants torturing him to use in propaganda. The men hung the boy “from the ceiling by his arms” and beat him with electrical cords. They also electrocuted him and upped the voltage when he screamed for his mother.